These thumbprint cookies with icing are so easy to make and delicious, too! There are only four ingredients in the cookies, and the icing is a snap to make. It’s so simple to make these homemade cookies for your family to enjoy! 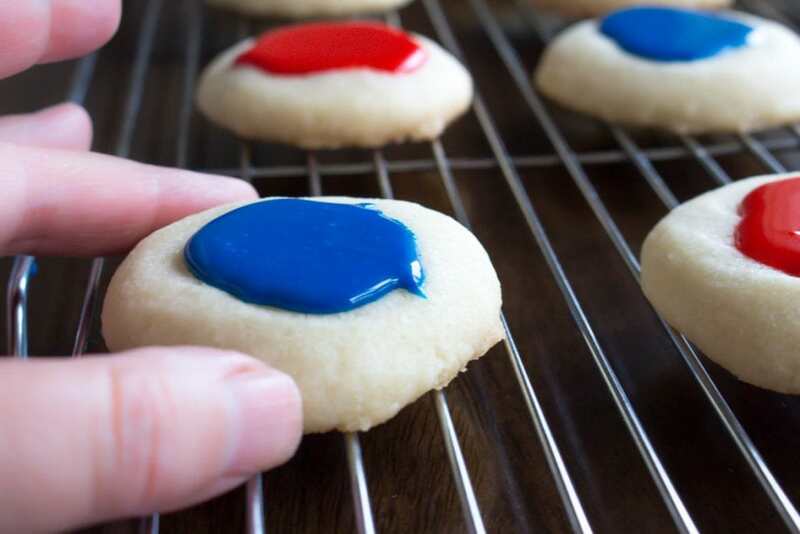 What I really love about these tasty cookies is that it’s so easy to switch up the food coloring in the icing. Just make green and red icing, and add holiday sprinkles, and boom – you have perfectly themed Christmas cookies. Pink or red icing is perfect for Valentine’s Day, green for St. Patrick’s Day. You can even make these in red, white, and blue for the Fourth of July. 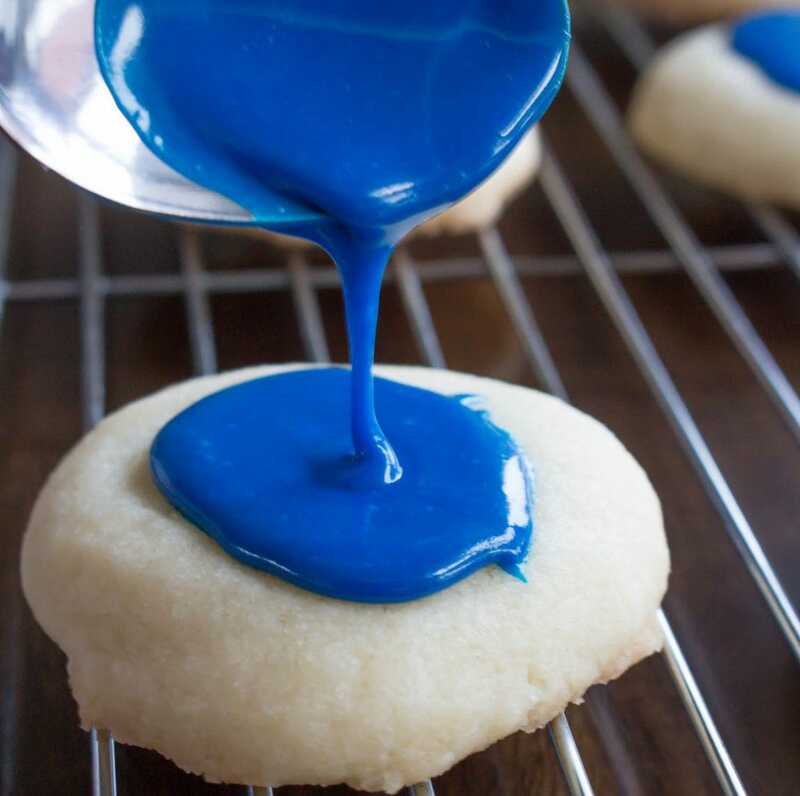 Make icing in your favorite team’s colors, and they’re fun for a Superbowl party! The only limit is really your imagination! If you’re looking for more yummy cookie and sweet recipes, check out our more traditional thumbprint cookies with jam, our never fail chocolate cupcakes, a decadent chocolate fresh fruit cake with whipped cream, or even our fun sweet and healthy chocolate chocolate fruit dip recipe with Greek Yogurt. 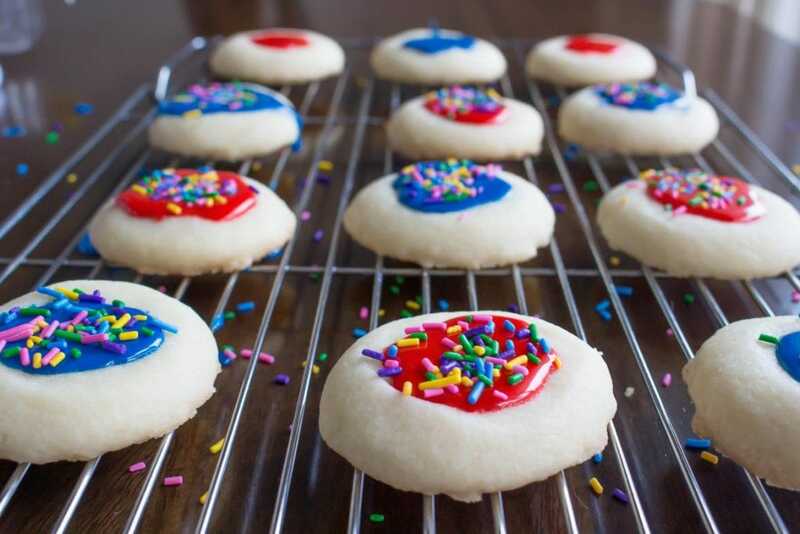 Here it is, our easy, delicious recipe for thumbprint cookies with icing and sprinkles. 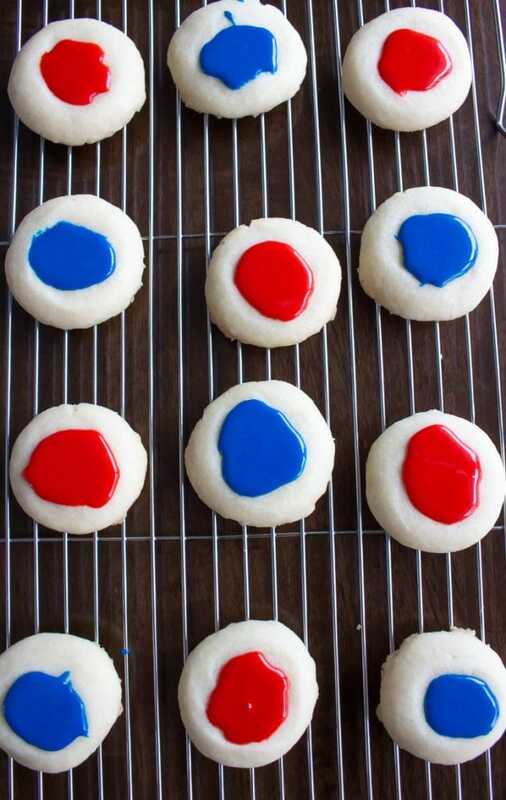 These are such easy cookies! Any time I want a cookie recipe that’s fast, and pretty enough to share, these are the ones I make. They’re great for school cookie drives, especially, as there are no nuts in the ingredients! food coloring. We like Wilton gel food coloring because it gives us beautifully vibrant color. See Wilton gel food coloring on Amazon here. These yummy, homemade cookies and icing only take about 15 minutes to make, including making the icing (plus cooking and decorating time). Start by creaming cream softened butter and white sugar until smooth in a medium bowl, and add almond extract and mix. Add flour until dough starts to form little balls, and stick together. 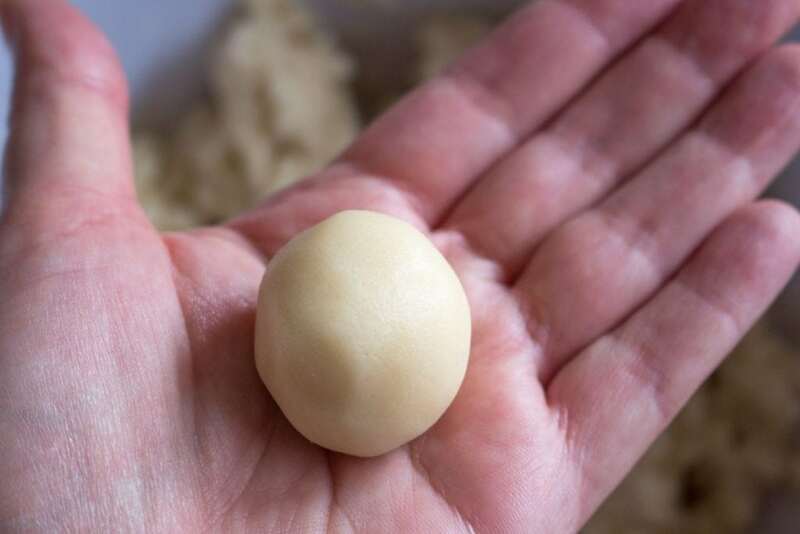 Roll dough into 1 1/2 inch balls with your hands. Using a 1/2 tsp measuring spoon, press an indent into the balls. Bake for 14 to 18 minutes, or until lightly browned underneath. Let cool at least half an hour before adding icing. In a medium bowl, mix confectioners’ sugar, almond extract, and 2 tsp milk. Add 1 tsp milk at at time until smooth. When cookies are cool, use a teaspoon to pour icing into indent in the middle of the cookies. If you’re like me, you’ll probably succumb to the temptation of warm cookie smell and sweet icing, and eat a few of these now. 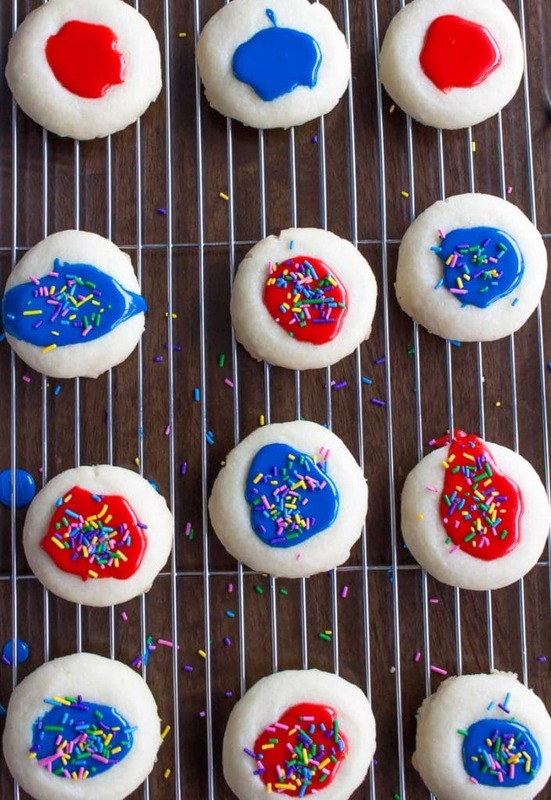 These are pretty cookies with only the icing on top. Even if you’re a little messy with the icing they’ll look great. Mine are definitely never perfect – check out the drips in the photo! If you want, you can skip the sprinkles. Here’s a secret: I’m not a huge fan of sprinkles, so I usually eat mine with just the icing. The kids love sprinkles, though, so I usually add some. Next, just add sprinkles on top. We used classic confetti sprinkles, but really you can add almost any kind you want! Tip! 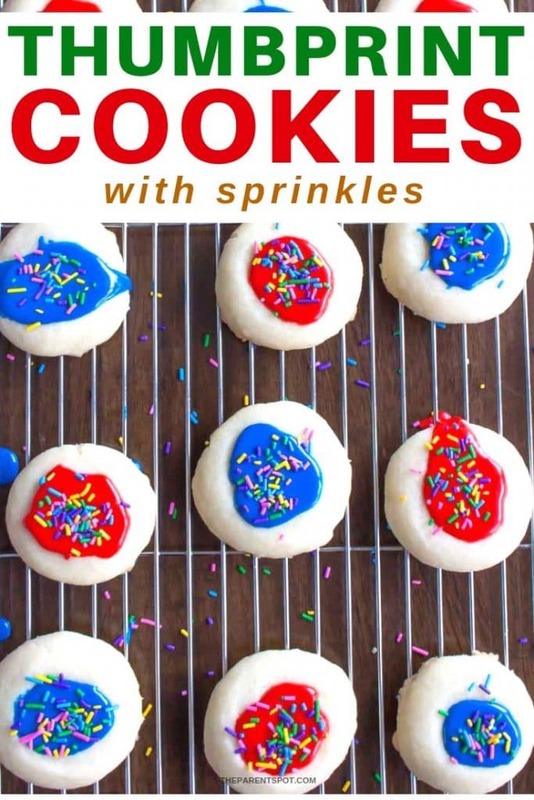 The sprinkles stick better if you add them right after the icing, before the icing has a chance to start drying! If you’re packaging the cookies to take away, wait an hour for the icing to dry. If not, enjoy right away! shortbread thumbprint cookies with icing . This recipe makes 36 cookies, and they’re about 105 calories a cookie. Want to make pecan thumbprint cookies with icing? Just add 1 cup of chopped pecans to the dry ingredients! Looking for thumbprint cookies with buttercream icing? Just swap out the icing in this recipe for our delicious, homemade buttercream icing with real butter. It’s so good! Want easy Betty Crocker icing on thumbprint cookies? 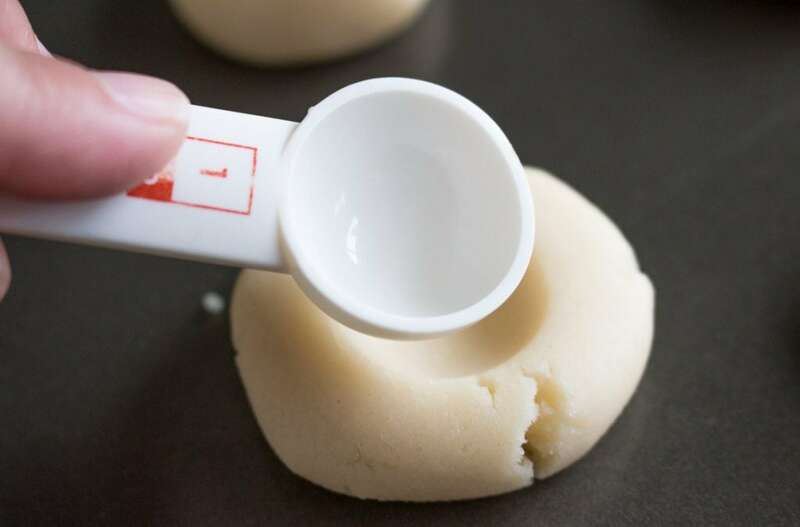 Want to make these easy thumbprint cookies with icing even easier? Just swap Betty Crocker icing for the icing in this recipe. Easy! These easy, delicious cookies are a favorite in our house! In a medium bowl, cream softened butter and white sugar until smooth. In a medium bowl, mix confectioners' sugar, almond extract, and 2 tsp milk. Add 1 tsp milk at at time until smooth. 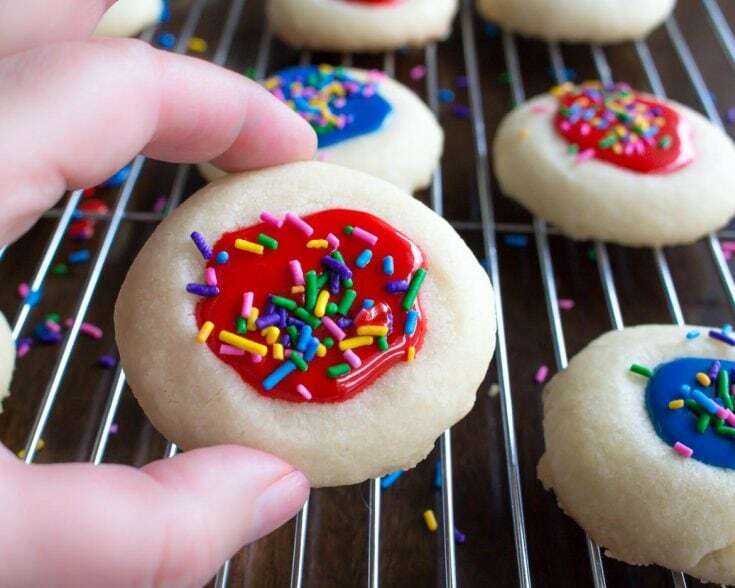 What a neat little twist on thumbprint cookies. I am definitely going to give these a try. I love the idea of coloring the icing to go with various holidays.